Most people have a dream job they are working towards finding. Your dream job may be a specific position, a job with a specific company, or a job that lets you use all of your skills. Whatever your dream is, you likely have a clear vision in your head for exactly what your ideal career will entail. Identify the problems causing you to feel unsatisfied and brainstorm ways to improve the position: The first thing to ask yourself is whether there is an actual problem that is making you dislike your job or whether your expectations were simply too high for reality to match. If something is wrong that is affecting how much you like your job, can you find a way to correct it? Perhaps you could talk with your boss about providing you with more training if you're feeling overwhelmed and confused, or talk with your boss about changing the process by which you do your job if you feel it is inefficient. Set a new goal for yourself: If you've been dreaming of a particular career for a long time and the job doesn't work out, you're likely feeling adrift. Don't let yourself lose focus on where you want your career to go. Instead, carve out a new dream for yourself so you will have something to work towards. Perhaps you can use your skills in a related field, or simply find a different company where you are a better fit. Define what you want and start making plans to achieve it. Learn from the setback about what you prefer going forward: Every job provides a learning experience, and you can learn from the trouble you are having to determine what you do and don't want in your career. This will help you make better choices going forward as you evaluate job opportunities so you can mold your professional life into something that makes you happy. 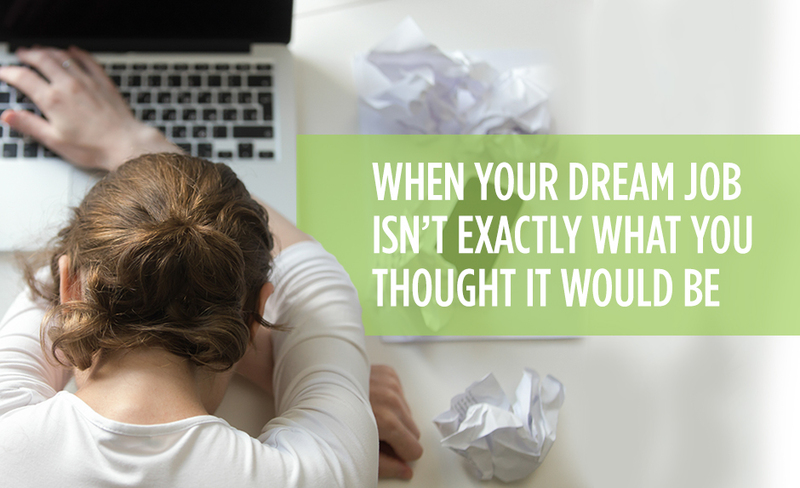 If you have decided your so-called dream job is a nightmare and you are ready to move on to a different opportunity, Eastridge Workforce Solutions can help. Our staffing service can work closely with you to identify the type of work environment where you will thrive and to determine what type of position is right for you. To find out more about how we can assist with finding an actual dream job that won't let you down once you get hired, give us a call today.